Oleander (Nerium oleander) is a versatile plant for USDA plant zones 9 through 11. This evergreen shrub or small tree can be used as a hedge or screen, a container plant or as a lawn specimen. Tolerant of urban conditions, it's a good choice for use in parking lots or along streets. Grow oleander in full sun for thickest growth; the shrub will be lanky and open in partial shade. Oleanders are drought tolerant once established and decline in wet soils. Oleander is a common hedge plant in warm areas. Prune oleanders in early spring or after flowering declines, since they produce flowers on new growth. Remove winter-damaged branches and any stems that rub against each other. Sterilize the pruners or loppers between cuts with alcohol or a solution of 1 part bleach to 9 parts water. Cut branches just above an outward-facing leaf node. Oleanders tolerate hard pruning, so you can severely prune the branches to control the plant's size, if desired. Remove broken branches whenever found, to prevent insect or disease entry. 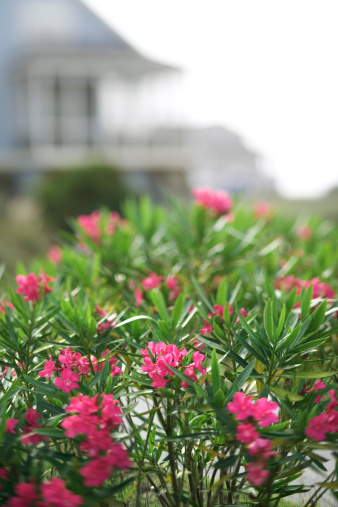 Oleander wood is brittle, so inspect your shrub or tree after bad storms. Prune out any suckers, also known as water sprouts, whenever they appear. These vertical, fast-growing stems that grow up from the base of the plant sap the plant's strength and inhibit flowering, according to the University of Hawaii. Remove any tall shoots that develop in dwarf cultivars. Trim back faded flower clusters and stem ends to encourage reblooming. If you live in an area that gets frost, stop deadheading in late summer or early fall, as new growth needs time to harden off before frost arrives. Rejuvenate old shrubs by removing old stems over a three-year period. Cut back one-third of old stems to ground level the first year. Renewing the plant this way allows you to continue to use the plant as a hedge or screen while rejuvenating the plant. Remove one-half of the remaining old stems in the second year. Cut out the remaining old stems in the third year. Thin any overcrowded new stems that grow up during the renewal process each year. Cut back the new shoots that you do keep by one-third to one-half, to encourage branching and strong growth.